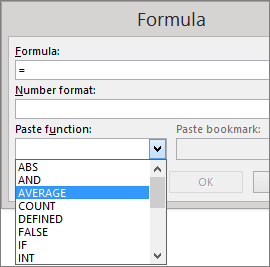 To add up a column or row of numbers in a table, use the Formula command. Click the table cell where you want your result to appear. On the Layout tab (under Table Tools), click Formula. In the Formula box, check the text between the parentheses to make sure Word includes the cells you want to sum, and click OK. Tip: If you change any of the numbers you’re adding, select the sum and press F9 to update the total.